When you’re looking for a points program to invest your time and energy into, there are quite a few considerations you need to keep in mind. First and foremost, you want to find a points program that is flexible so that you aren’t locked into one type of redemption. A second and almost equally important aspect for consideration is the ease of collection. If you had a point program that allowed you to redeem for a First Class flight after $100 in spend but you could only get the points in Mogadishu on every 4th Wednesday of the month that doesn’t fall on an even number, the program is most likely useless to you. You also want a program that has some staying power so that you are confident that after all your efforts, the program will be around for you to redeem. Take for example the Aeroplan program. I can almost guarantee that in June of 2020, CBC will feature multiple stories of people that have 500,000 Aeroplan Miles and no way to redeem them for that vacation of a lifetime they thought they were saving for. Today, we explore the most flexible, and I would argue, the most valuable points program available to Canadians. What Is Flexibility So Important? Perhaps a bit of a bold statement but 10 out of 10 seasoned Travel Hackers would most likely tell you that having a flexible points program is important because redeeming for what you want within points programs is simply getting harder and harder as the years pass by. 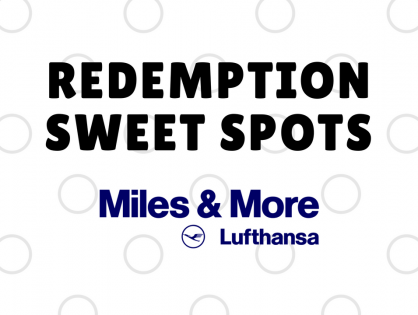 By having multiple redemption options, you give yourself a better chance at using your points the way you want to. I would even hazard a guess that if most Travel Hackers were to start all over again with the knowledge they have now, almost assuredly, all of them would invest their time into programs with maximum flexibility. Not only do you want points that can be transferred into different airline and hotel programs but you also want to give yourself other redemption options if you still can’t find what you are looking for. Which Program Is Best for Canadians? If you’ve been reading the blog for a while, the answer will be fairly obvious to you but for those that are new to the blog or new to Travel Hacking, this information will likely save you a TON of headache and wasted efforts. The answer, of course, is American Express’ Membership Rewards Program. The sceptics out there might view this recommendation as a way to solicit for referral points. While we certainly do earn referrals for credit card signups, it is definitely not the driving factor for the recommendation, rather, the main reason is to ensure that you can get the most out of your points. 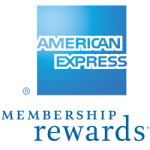 Why American Express Membership Rewards? So why are Membership Rewards (MRs) so flexible? Well, that’s because American Express has done a masterful job at allowing for so many different types of redemption that the program should fit almost anyone looking for a valuable points program. From transfers to airline programs to paying off your bill with points and everything in between, Membership Rewards has you covered. Let’s take a look at all the options MRs provide you. I can almost guarantee that you’ll find something that appeals to your inner Travel Hacker. Remember, the biggest benefit that Membership Rewards provides is optionality or put another way, a way to ensure you can derive value from your points in ALL situations. 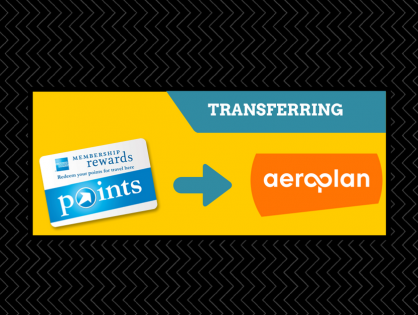 The most common use of Membership Rewards points is by transferring them to airline or hotel miles/points. MRs in Canada give you the flexibility to transfer to 6 airlines and 2 hotel programs. 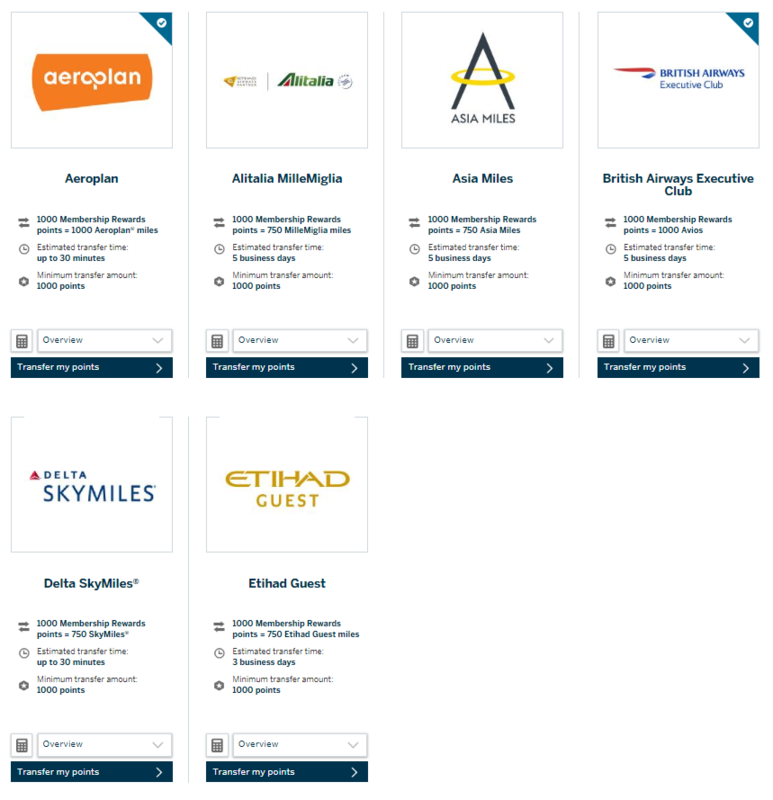 Air Canda’s Aeroplan and British Airways Avios are the most likely transfer program that you will take advantage of from Canada but that’s not to say there aren’t great redemption possibilities with Cathay, Alitalia, Delta or Etihad because there certainly are … you just have to work a little harder to unearth them. 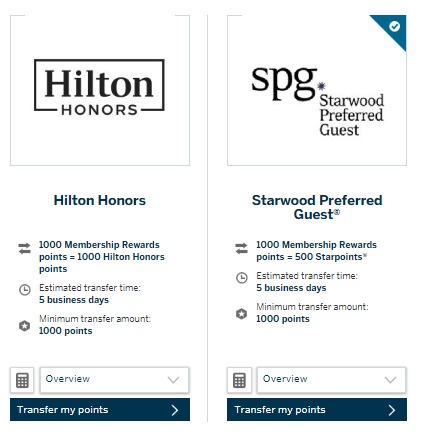 Hotel transfer options are also an option through Membership Rewards for the hotel programs of Hilton and SPG. What’s great about the points transfers is that you can look for availability across multiple programs and only transfer after you find it. If you have Aeroplan Miles, you are stuck looking for availability with Aeroplan. If you have Membership Rewards, you can look for availability across 6 programs and then make your decision. Transfers to airlines and hotels are great but even the most seasoned award bookers have times where they simply can’t find award availability. With some program, if you can’t find availability, you are simply out of luck. Not so with Membership Rewards. In November 0f 2016, American Express introduced another way to use your Membership Rewards towards travel called the Fixed Point Travel Program. While this method does not give you the same potential for value that transfers to Airline and Hotel program might, it does open up a world of travel possibilities. Essentially what the program does is allow for the use of MRs towards travel using the redemptions charts below. The nice thing about this program is that you are able to redeem for either Economy or Business Class travel with a few stipulations. With every redemption possibility, there are pros and cons and the Fixed Point Travel Program is no different. Here a list of the pros and cons. If you redeem for the maximum value of the airline ticket, you will see a return of 1.7 – 2.0¢/point, which is pretty good redemption value given the flexibility it provides you. While this program may not appeal to all, the point is that it provides you with an additional option. The American Express Flexible Points Travel Program, not be confused with the Fixed Points Travel Program above, provide an even higher level of flexibility because you can use your points for travel with NO RESTRICTIONS but the tradeoff is that you receive 1¢/point value for all redemptions. What’s great about this redemption is that you can even pay the taxes and fees with your points. With the Flexible Points Program, you “write-off” travel expenses with your points. All you have to do is charge a travel-related expense (airfare, hotel, car rental, etc. ), log into your American Express Membership Rewards account and apply the points against the expense. Here’s a sample of qualified travel purchases on my Cobalt card. 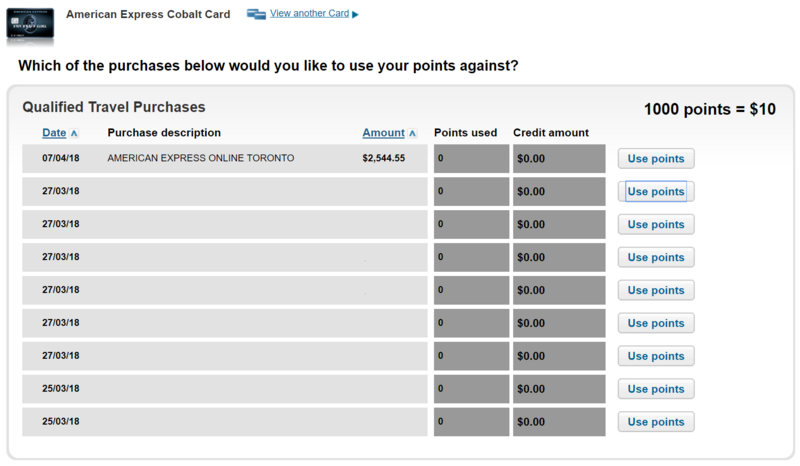 I have hidden much of the information above to protect my privacy but you can see how easy it is to use your points. Once you choose which travel expense to write-off, simply click on “Use points” and a new pop-up will appear asking you how many points you want to use. To me, this is an excellent use of points because of the incredible flexibility of the points. Some may find that 1¢/point is not a great redemption but I would argue that if it means the difference between travelling or not, it’s a good use of points. 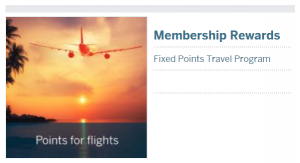 In this section and going forward, we start to move into redemptions that result in redemptions that are either 1¢/point value or less and while I would generally caution against using your points for these things, I still give AMEX a LOT of credit for even giving you the option of using the points for something. Much like the FlexiblePoints Travel Program, you can use your Membership Rewards points against any and all purchases. The problem is that you will receive 0.7¢/point when you redeem. On the positive side, using the points are as easy as you saw in the Flexible Points Travel Program. And yes, you can definitely write off a single penny using 1 MR point if you so choose. That’s we in the biz call extreme flexibility. American Express allows you to use your points for merchandise like toaster and TVs. In general, the redemptions are very poor. So poor in fact, if you wanted the item, I would suggest you make the purchase with your AMEX and writing off the purchases with the Points for Purchase Program. I did a quick comparison on pricing from Amazon.ca on one of the items they had on offer, the Breville Barista Express Espresso Machine, which was on their Points Drop (think sale) page. Without boring you with the math, it came out to 0.6¢/point value, which is less than the 0.7¢ the Points for Purchase offers. If that was what the value was from the Points Drop page, imagine how poor the value would be on other items. There isn’t much to say outside the fact that Amazon offers 0.7¢/point redemption value with TicketMaster coming it at 1.0¢/point. With gift cards, the redemption value varies but is generally very poor as well, with most gift cards clocking in at less than 0.7¢/point. You might already be seeing a trend after reading the above redemption options … how very perceptive of you. 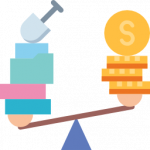 With Membership Rewards, there’s a distinct trade-off between value and utility (ease of use). If you want more value, you have to be willing to give up ease of use. 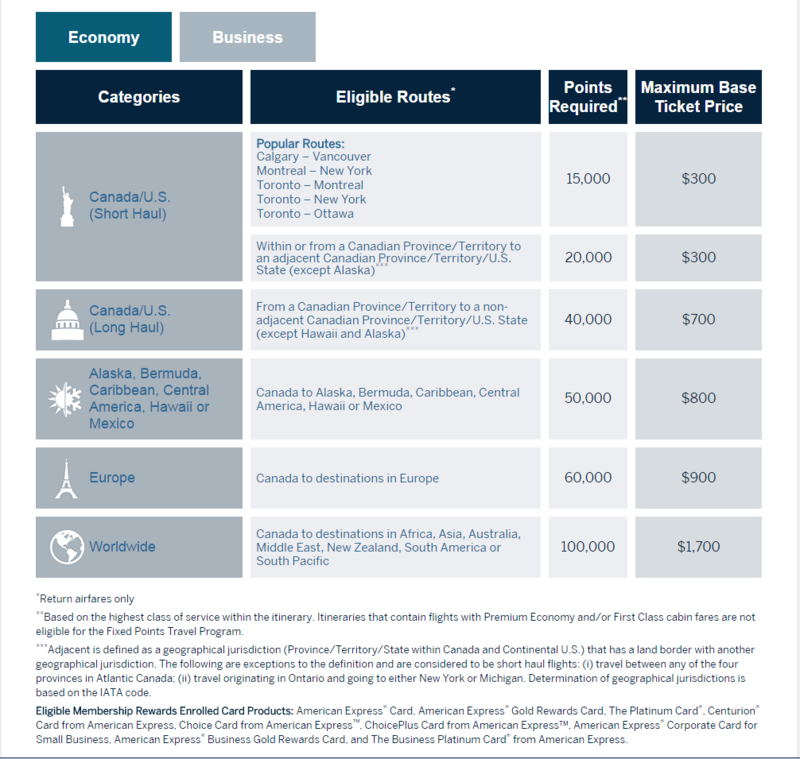 MR to Frequent Flier Programs such as Aeroplan can see redemption values of over 10¢/point but you have a LOT of work ahead of you to find that award availability. Compare that with the Points for Purchase Program. It is INCREDIBLY easy to use but you will only get 0.7¢/point value. To me, this is a very fair and logical way to structure a points program and it’s easy to understand. Everyone should be able to find an equilibrium that fits their lifestyle with Membership Rewards. Earning Membership Rewards is actually pretty easy. If you have a good credit history and the financial means/responsibility to pay your bills on time, you can rack up Membership Rewards quite quickly and with relative ease. American Express Colbalt – 40,000 Membership Rewards Select points. Get 2,500 points on a monthly basis based on meeting a minimum spend of $500 per month. Get an additional 10,000 points if you spend $3,000 in the first 3 months – $10/month fee ($120 per year). The offers are current as of the date of publication but if you are reading this later on, feel free to check out the most recent offers on PointsNerd’s Google Sheet of Current Credit Card Offers. That Google Sheet will always be up to date. The links above will take you to PointsNerd’s reviews of the cards to see if they make sense for you. 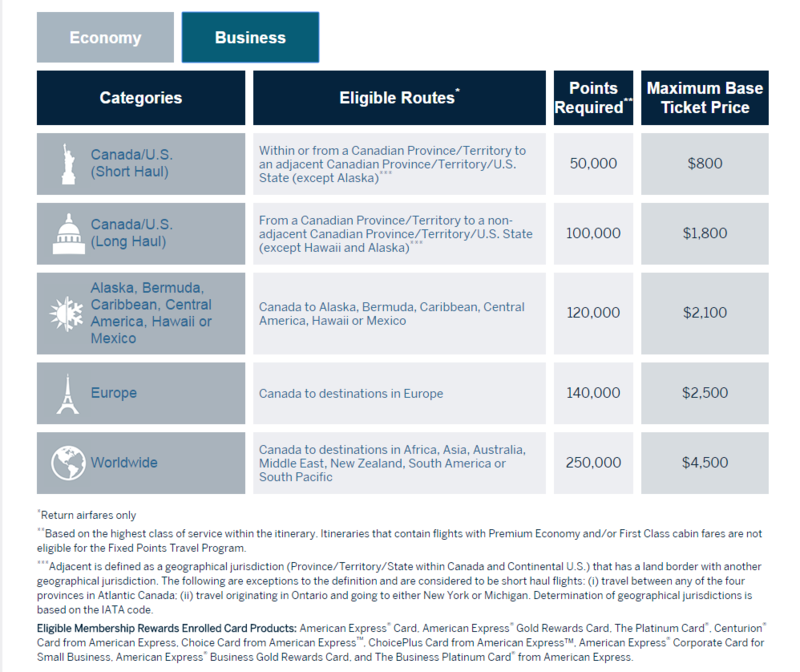 American Express’ Membership Rewards is the most flexible points program available to Canadians bar none. What I love about the program is that it caters to the entire spectrum of people that participate in points programs. Unlike with other programs, you don’t have to be an expert to derive value out of the program because of all the options you have available to you. Having been a member of American Express and their Membership Rewards Program since 2005, I can tell you that they have done a masterful job in providing more and more options to make the program attractive and useful for all. I rather transfer everything to SPG for flight option. British Airways Avios – For the shorthaul it is okay with their partner but ridiculous tax+etc for BA flights. Not worth using it. Etihad Guest Miles – Shrinking daily. Cutting US flights and they will be in serious restructure in any moment. ME3 is known for extreme changes for anything. Who knows they may axe the entire program? Yes, but Aer Lingus is one of the best, cheapest ways to get to Europe. You can also book flights separately. Thanks for this post. Can you please update the transfer options to the various hotel points programs, to give us a sense of what if anything is lost. As in, MR is usually earned 1$:1point. If you take that MR and move it to SPG. Are they giving you the native $1:?spg you’d normally earn in the native SPG Amex card/program? Or do you lose 50% of your MR point in that exchange. Any idea if AMEX Canada will add Marriott as transfer partner? And if so, will transfer ratio be 1:1.5? AMEX USA has confirmed they will add Marriott and ratio will be 1:1, which is what we expected since the AMEX-SPG ratio was 3:1. Great summary Brian. I realize my comments are late but I received a “sale” for products from Amex today (Aug 27 2018), 25% off points. Then I checked out their other use of gift cards especially Air Canada. Recalling your article here, I did an evaluation and it comes out to less than $0.007/point. That doesn’t make sense since you can easily apply your points against an airfare at a rate of $0.01/point. As you stated, skip the gift cards. Thanks for doing a costing for points, it’s very helpful.